اشرفی, خسرو, احمدی ارکمی, علی, شفیع پور مطلق, مجید. (1396). شبیه‌سازی صعود پَره دودکش با استفاده از روش ترکیبی دینامیک شاره‌های محاسباتی RANS-LES در شرایط خنثای جوّی. مجله ژئوفیزیک ایران, 11(1), 66-83. خسرو اشرفی; علی احمدی ارکمی; مجید شفیع پور مطلق. "شبیه‌سازی صعود پَره دودکش با استفاده از روش ترکیبی دینامیک شاره‌های محاسباتی RANS-LES در شرایط خنثای جوّی". 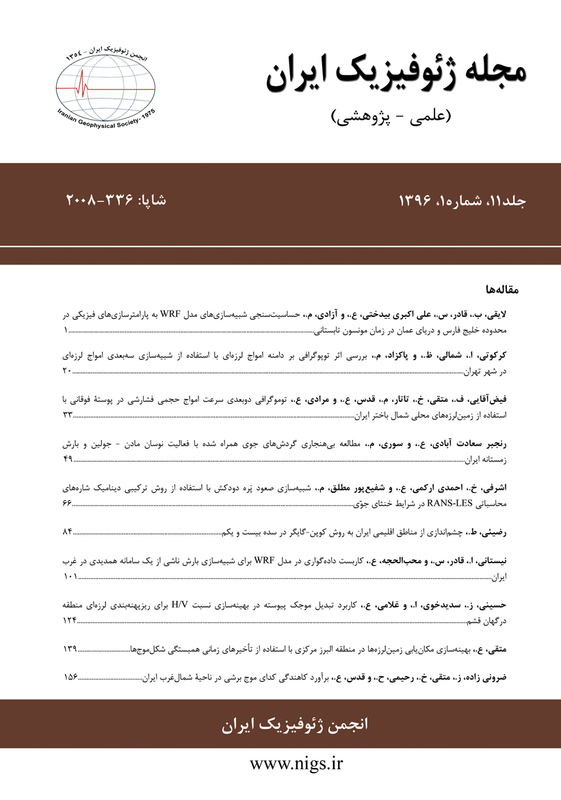 مجله ژئوفیزیک ایران, 11, 1, 1396, 66-83. اشرفی, خسرو, احمدی ارکمی, علی, شفیع پور مطلق, مجید. (1396). 'شبیه‌سازی صعود پَره دودکش با استفاده از روش ترکیبی دینامیک شاره‌های محاسباتی RANS-LES در شرایط خنثای جوّی', مجله ژئوفیزیک ایران, 11(1), pp. 66-83. اشرفی, خسرو, احمدی ارکمی, علی, شفیع پور مطلق, مجید. شبیه‌سازی صعود پَره دودکش با استفاده از روش ترکیبی دینامیک شاره‌های محاسباتی RANS-LES در شرایط خنثای جوّی. مجله ژئوفیزیک ایران, 1396; 11(1): 66-83. اغلب سامانه­ها در طبیعت دارای دینامیک غیرخطی هستند و خطی­سازی آنها تنها یک فرض ساده­کننده است. تلاطم در جریان­های جوّی نیز اغلب حاکم است و آرام بودن یا آرام فرض کردن آنها، به‌ عنوان ساده­سازی مسأله تلقی می­شود. در صعود و پراکنش پَره دودکش Plume) (Stack، بویژه در فواصل نزدیک به آن، تلاطم جوّی و تلاطم ناشی از پَره دود خروجی از دودکش تأثیر قابل توجهی دارند. هدف اصلی این پژوهش بررسی تأثیر تلاطم‌ جوّی بر پره دودکش است. رسیدن به این مهم، نیازمند پیش‌بینی مناسب نقش تلاطم در رفتار پَره دودکش و صرف هزینه محاسباتی کمتر در مقایسه با دقت شبیه‌سازی است؛ بنابراین در این پژوهش برای نخستین بار از ترکیب روش‌های شبیه‌سازی پیچک­های بزرگ و میانگین­گیری رینولدز به منظور شبیه‌سازی رفتار پَره دودکش و یک روش ترکیبی دینامیک برای پارامترسازی نقش پیچک­های ریز استفاده شده است. شبیه‌سازی عددی رفتار پره دود با استفاده از روش مذکور و متداول انجام گرفت. توزیع دما در فواصل مختلف پایین­دست دودکش با داده‌های تجربی مقایسه و صحت نتایج بررسی شد. نتایج نشان داد که روش ترکیبی پیشنهادی نسبت به روش‌های میانگین­گیری رینولدز و روش ترکیبی موجود در نرم­افزار فلوئنت، توزیع دما در پایین­دست را با دقت بیشتری پیش‌بینی می‌کند. همچنین خطای تخمین صعود پَره دود محاسبه شده با روش‌های میانگین­گیری رینولدز، روش ترکیبی موجود در نرم­افزار فلوئنت و روش ترکیبی پیشنهادی در حالت خنثای جوّی به ترتیب برابر با 0437/0، 054/0 و 0323/0 است. با مقایسه صعود پَره دودکش با معادله انتگرالی بریگز، مشاهده شد که روش انتگرالی به دلیل عدم در نظر گرفتن اختلاط قائم ناشی از تلاطم، میزان صعود را بیش از مقدار واقعی تخمین می‌زند. صحت شبیه‌سازی تلاطم با استفاده از نمودار چگالی طیفی انرژی جنبشی متلاطم و پارامتر نسبت تلاطم شبیه‌سازی شده به تلاطم مدلسازی شده، بررسی شد. از نتایج این پژوهش می‌توان در بهینه‌سازی و اصلاح روابط موجود برای تخمین صعود پَره دودکش در شرایط مختلف پایداری، با در نظر گرفتن نقش تلاطم مکانیکی و گرمایی جوّ و تلاطم پَره دودکش استفاده کرد. Most physical systems in nature have nonlinear dynamics and the system linearization of these physical systems is only a simplified assumption. The atmospheric motions, with the same philosophy, have a turbulent structure and ommiting the turbulent motions in the atmosphere is only a problem simplification assumption. When a buoyant jet of a chimney enters the atmosphere, it behaves like a turbulent flow, in which the atmospheric turbulence and self-generated turbulence of the plume play major parts. The present survey aimed at demonstrating the effects of turbulence on plume dynamics through computer simulation. The well-known turbulent flow simulation methods commonly used to simulate plume dynamics and atmospheric processes are: Direct numerical simulation (DNS), Reynolds averaged Navier-Stokes (RANS) and large eddy simulation (LES), which most distinguishing feature is their way of parameterizing the turbulence. As far as computational requirements, accuracy and turbulence simulation, the former two models are the two extremes while LES occupies an intermediate position between them, directly simulating the large-scale eddies and parameterizing the less important sub-grid scale (SGS) dissipative processes using sub-grid models (SGM). Most often, LES can predict the unsteadiness and intermittency of the turbulence structure, which is the most important feature of a buoyancy-driven jet. It should be noted that it is not efficient to employ full LES method when tackling an issue with certain unimportant zones. Furthermore, in the case of strong turbulent motions, the scale of flow structures near the rigid bodies are small and LES method method requires very fine grids that can increase its computational cost as large as DNS. To surmount this drawback, a hybrid RANS-LES method with a new mixed scale sub-grid parameterization model was applied to simulate the turbulent plume dynamics in ANSYS Fluent 14.5 software. The effectiveness and the accuracy of the mentioned turbulence simulation method was demonstrated through simulation study and experimental data in the neutral atmospheric conditions. Comparing the simulation results of the RANS method, the default hybrid RANS-LES method with static sub-grid scale parameterization and the new RANS-LES method with dynamic mixed scale parameterization indicated that the mean temperature profile at stack downstream was more accurately predicted by the new hybrid method. The root mean square error of plume rise estimation of the RANS method, the default RANS-LES method and the new hybrid RANS-LES method were 0.0437, 0.054 and 0.0323, respectively. It was further demonstrated that the Briggs integral plume rise model could not properly predict the plume rise in the presence of turbulence, because it does not consider the updraft and downdraft turbulence-induced motions in the atmosphere. Ultimately, we checked the capability of the new hybrid method to resolve the substantial parts of the turbulent motions. The turbulent energy transfer from the energy containing scales to inertial sub-range followed the well-known law. The capability of the new hybrid method in predicting the mean profile and the turbulent structure can be employed in the study of the effects of turbulent parameters on plume rise in different atmospheric stability classes. Bechmann, A., Sørensen, N. N., Johansen, J., Vinther, S., Nielsen, B. S., and Botha, P., 2007, Hybrid RANS/LES Method for High Reynolds Numbers, Applied to Atmospheric Flow over Complex Terrain: Journal of Physics: Conference Series, 75(1), 12054-12068. Bechmann, A., 2006, Large eddy simulation of atmospheric flow over complex terrain, in Riso National Laboratory: Technical University of Denmark Roskilde, Denmark. Beychok, M. R., 2005, Fundamentals of Stack Gas Dispersion. 4 ed. : author-published. Blocken, B., Stathopoulos, T., and Carmeliet, J., 2007, CFD simulation of the atmospheric boundary layer–wall function problems: Atmospheric Environment, 41(2), 238–252. Boussinesq, J., 1877, Théorie de l’Écoulement Tourbillant Savants: Mem. Présentés par Divers Academie des Sciences Institute de France, 23, 46-50. Briggs, G. A., 1984, Plume rise and buoyancy effects: Atmospheric Science and Power Production, 327-366. Bringfelt, B., 1968, Plume rise measurements at industrials chimneys: Atmospheric Environment, 2, 575-598. Cai, X. M., 2000, Dispersion of a passive plume in an idealised urban convective boundary layer: A large-eddy simulation: Atmospheric Environment, 34, 61-72. Contini, D., Cesari, D., Donateo, A., and Robins, A. G., 2009, Effects of Reynolds number on stack plume trajectories simulated with small scale models in a wind tunnel: Journal of Wind Engineering and Industrial Aerodynamics, 97, 468–474. Durrani, F., 2013, Using Large Eddy Simulation to Model Buoyancy-Driven Natural Ventilation, in Civil and Building Engineering: Ph.D. thesis, Loughborough University. Fedorovich, E., Nieuwstadt, F. T. M., and Kaiser, R., 2001, Numerical and Laboratory Study of a Horizontally Evolving Convective Boundary Layer. Part I: Transition Regimes and Development of the Mixed Layer: Journal of the Atmospheric Sciences, 58(1), 70-86. Ferziger, J. H., Clark, R. A., and Reynolds, W. C., 1977, Evaluation of Subgrid-Scale Turbulence Models Using a Fully Simulated Turbulent Flow: Stanford University: Thermosciences Division, Department of Mechanical Engineering, 75. Franke, J., Hellsten, A., Schlunzen, K. H., and Carissimo, B., 2011, The COST 732 best practice guideline for CFD simulation of flows in the urban environment: a summary: International Journal of Environment and Pollution, 44, 419–427. Gousseau, P., Blocken, B., and Heijst, G. V., 2013, Quality assessment of large-eddy simulation of wind flow around a high-rise building: validation and solution verification: Computers & Fluids, 7, 120-133. Gryning, S. and Lyck, E., 1984, Atmospheric dispersion from elevated sources in an urban area: comparison between tracer experiments and model calculations: Journal of Climate and Applied Meteorology, 23, 651–660. Gryning, S. E. and Batchvarova, E., 2005, Advances in air pollution modeling for environmental security: in Advances in urban dispersion modelling, NATO advanced research workshop. Halliday, E., 1968, Measurements of the rise of hot plumes: Atmospheric Environment, 2(5), 509-516. Hanna S. R., Chang J. C., and Strimaitis D. G, 1993, Hazardous gas model evaluation with field observations: Atmospheric Environment, 27A, 2265–2285. Hanna, S. R., Strimaitis, D. G., and Chang, J. C., 1991, Evaluation of fourteen hazardous gas models with ammonia and hydrogen fluoride field data: Journal of Hazardous Materials, 26(2), 127-158. Haren, L. V., and Nieuwstadt F. T. M., 1989, The behavior of passive and buoyant plumes in a convective boundary layer, as simulated with a large-eddy model: Journal of Applied Meteorology, 28, 818-832. Hu, G., Tse, K. T., Kwok, K. C. S., and Zhang, Y., 2015, Large eddy simulation of flow around an inclined finite square cylinder: Journal of Wind Engineering and Industrial Aerodynamics, 146, 172-184. Hu, L. H., Xu, Y., Zhu, W., Wu, L., Tang, F., and Lu, K. H., 2011, Large eddy simulation of pollutant gas dispersion with buoyancy ejected from building into an urban street canyon: Journal of Hazardous Materials, 192, 940– 948. Kolmogorov, A. N., 1941, The local structure of turbulence in incompressible viscous fluid for very large Reynolds number: Dokl. Acad. Nauk. SSSR, 30, 9-13. Lamb, R. G., 1978, A numerical simulation of dispersion from an elevated point source in the convective planetary boundary layer: Atmospheric Environment, 12, 1297-1304. Lesieur, M., 1990, Turbulence in Fluid: Second Revised ed. 1990, Dordrecht: Kluwer Academic Pres. Z. S., 2011, Large eddy simulation of wind field and pollutant dispersion in downtown Macao: Atmospheric Environment, 45, 2849-2859. Mahesh, K., 2012, The interaction of jets with cross flow: Annual Review of Fluid Mechanics, 45. Marro, M., Salizzoni, P., Cierco, F. X., Korsakissok, I., Danzi, E., and Soulhac, L., 2014, Plume rise and spread in buoyant releases from elevated sources in the lower atmosphere: Environmental Fluid Mechanics, 14, 201-219. Mathey, F., Cokljat, D., Bertoglio, J. P., and Sergent, E., 2006, Specification of LES inlet boundary condition using vortex method: Progress in Computational Fluid Dynamics, 6, 58-67. McQuaid, J., 1985, Heavy gas dispersion trials at Thorney Island: Elsevier, New York. Nakiboglu, G., Gorle, C., Horvath, I., Beeck, J. V., and Blocken, B., 2009, Stack gas dispersion measurements with Large Scale-PIV, Aspiration Probes and Light Scattering Techniques and comparison with CFD: Atmospheric Environment, 43, 3396-3406. Nottrott, A., Kleissl, J., and Keeling, R., 2014, Modeling passive scalar dispersion in the atmospheric boundary layer with WRF large eddy simulation: Atmospheric Environment., 82, 172-182. Paulucci, S., 1982, On the Filtering of Sound from the Navier-Stokes Equations: Report SAND-82-8257: Sandia National Labs. Pontiggia, M., Derudi, M., Busini, V., and Rota, R., 2009, Hazardous gas dispersion: A CFD model accounting for atmospheric stability classes: Journal of Hazardous Materials, 171, 739–747.